Don Smith was the ‘king’ of the restaurant review for the Los Angeles Times for decades. His words and opinions would either bring a restaurant fame and fortune or could close them down in months. He usually stuck to the Los Angeles restaurant scene in most all of his columns. But as fate would have it, one of his close friends was a neighbor of Tulsa Rib Company AND a rib fanatic. This friend was one of our first customers, so he claimed and we believe. While shopping at his market, Alpha Beta (another name from the past), this friend noticed our new sign a few store fronts down. Since he had never found a rib joint that could match his needs, he truly believed our little restaurant was a ‘never going to be’ before we even got off the ground. After he loaded his shopping bags into his car he swung by to take a look and give us a try. As Tulsa Folk Lore goes, he ordered a Baby Back Rib dinner to go and could not believe how delicious the ribs were that he returned that same night with his entire family to enjoy our food. 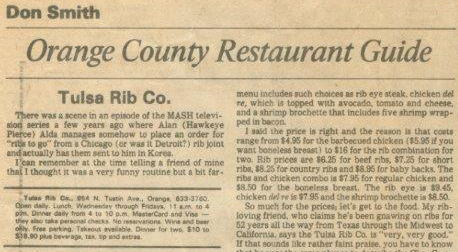 As this article points out, he brought the famed Don Smith into the restaurant to taste for himself and this story was the result of that visit. This article became critical for our future. Written in the largely circulated Los Angeles Times with a huge following, his readers streamed in to taste Tulsa Rib Company for themselves. They, too, became some of our earliest and best customers we could have ever imagined. As the years went along, Don and this friend could be seen inside our little rib restaurant for their slice of ‘rib heaven’ as they both would claim. Today, these ‘Don Smiths’ are viewed on social media and we are most lucky to have hundreds of ‘food critics’ become our loyal fans to bring in many more for their meals.